A couple months ago while taking my early morning stroll, I noticed a creature quietly sailing though the canal, as smooth as butter. I couldn’t get a close enough look, and could only see its snout. I had assumed it was possibly a fox, a possum, or a groundhog. It was cutting through the water, much like a river otter does, except that there are no river otters in my area. Then a few weeks ago, along the same trail (Delaware Canal Towpath, I noticed that my next door neighbor had a tree that had been gnawed down (yes I had to defer to the dictionary to spell gnawed). The tree was raw at its base, the bark stripped away first, then all of the sudden, it looked like a giant pencil sharpener had taken down, not one, but four trees! So about two weeks ago as I was ready to contact the PA Park and/or Game Commission, I noticed two Game Commission trucks parked in front of my house. Apparently, others had called, and it was confirmed that there was a damn beaver problem. That would help explain why about ½ mile north on the canal, a blockage was preventing passage for kayaks and canoes—and the ducks! The Park Rangers from the Game Commission didn’t mind speaking with me at all, and were really friendly. 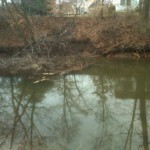 They set four beaver traps in the water. As it turns out the den (is) located one house to my right—but most of the damage was performed one house to my left. Luckily, I have a fence along the canal, which has been there the last 29 years or so. Note that the new ordinance says no fences with 25 feet of the canal—so my fence is grandfathered in and legal. Lucky for me there was no damage, so far, to any of the large trees in my yard. 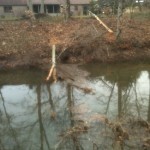 Apparently, as recently as a month ago, two beavers were trapped about a mile or so north of my home. Now, the Rangers were trying to trap an additional family. 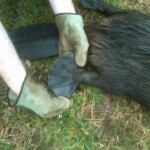 Last week while speaking with my wife, she halted and screamed “Ohhhh—look at thaaaat.” Walking across our front yard, there was a Ranger with a 27 inch, 8 pound beaver slung over his back, being carried by its tail. The tail made it look larger than it really was. I ran outside to get the details, and learned that the woman park Ranger had a penchant for beaver stew. Evidently, beaver meat tastes pretty good–not too gamey; I may never know. They said they didn’t know how many beavers were there, but that there could be up to eight! I had previously assumed it was a single beaver, but learned they live in groups. I had no idea beavers would somehow manage to travel ½ mile west from the river, and try to make the canal their new residence. Then the other day, I saw a Ranger hauling away another larger one. In chatting with him, I learned that was the mother beaver—about 6 -8 lbs. The traps are placed under the water, and this one had been trapped only by its back webbed foot—just barely. The good news is that, apparently, beavers will hold their breath under water for a long time, before they immediately drown. So, luckily, there isn’t much suffering involved. That is the only reason I decided to include the photos for this post—otherwise, I don’t like seeing any creature suffer. While my family feels badly for the beaver family, we would feel a lot worse if a tree was gnawed down and ended up taking out a side of our home—or person. Now I know to be on the lookout for beavers, and realize the damage they can quickly cause. Previously I had no idea beavers would even opt to live in the Delaware Canal. Timberrrrrrr….